How to book space-only meetings without breaking out in an itchy rash. Let’s face it, nothing brings out more redness, puffiness, and scratchiness than trying to book a space-only meeting. Whether it’s a one-day employee rally, a dinner meeting, or a 14-city roadshow, it’s pretty much always painful to try to rent meeting space when you have little or no sleeping rooms. I bet that many of you have resorted to completely eliminating hotels from the mix – opting for restaurants, theaters, and club houses instead. But it doesn’t have to be that way. Hotels want your business. It’s how your business affects them that makes all the difference. So let’s start with what I call POMS: Principles of Meeting Space that will guide you in your quest to easily book your next space-only meeting. 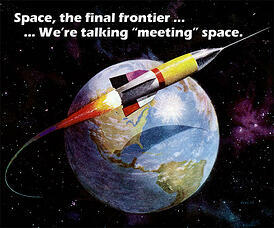 Space is, in fact, the final frontier. (For all you young’uns, that’s a Star Trek reference.) Hotels can’t sell their sleeping rooms to groups if they don’t have meeting space to match the availability. That means that the hotel’s most precious asset isn’t its sleeping rooms but rather its meeting space. With this in mind, how and when you use that space will be key to whether the hotel can sell it to you or not. Timing is everything. As with most things hotel-related, when you book your space-only meeting has an enormous effect on whether you’re successful or not. Sure, the closer in you book your space, the more likely you are to find something. But that’s not the only way. You can in fact book a meeting further out if you know what questions to ask (check tip #4 below for one such question). With these principles in mind, let’s talk turkey. Here are some tips to help you position your space-only meeting so that both you and the hotel have a little fun booking it. Know what “Free Sell” means and ask your hotel contact for it. This is a term used to describe a date when the catering department takes over the sale of the meeting space and can sell it without approval (or at least with fewer hurdles to jump through for approval). That could be 90 days, 120 days, or as close as 30 days. Know who to call. The catering department in most hotels is the one responsible for selling the meeting space and meals. So start there as they do get credit for booking your space-only meeting. You are what you eat. Instead of paying room rental, host a meal or two with some coffee breaks in between. Often, hotels will waive any rental in lieu of a good food and beverage package. Want to increase your chances of locking in that space? Add a bar. If you’re in big cities, find out the closest city-wide convention to your dates. Nothing spells “available space” more than a city-wide group. In a city-wide, hotels commit rooms and most often, no space. A rare moment when there’s more space than rooms to sell. Be flexible on dates. When talking to your hotel contact, give them a range of dates. You want to work hard to fit in where they need you. This will play a big role in the overall savings as well. Oh, and be open to a weekend. Try to book your space-only meeting as close to the meeting date as possible. As time dwindles down, hotels have a tougher and tougher time selling their space and rooms. This works in your favor, as hotels shift from conserving their space to an outright fire sale. The adage, “Better to get some revenue than no revenue,” plays well here. If you have a series of meetings, try to keep them with the same hotel. Or at least with the same brand. Leverage future meetings with sleeping rooms. If you have an upcoming meeting with sleeping rooms, work to negotiate both meetings together. If you need to book further out, try to find days just before or after a holiday.